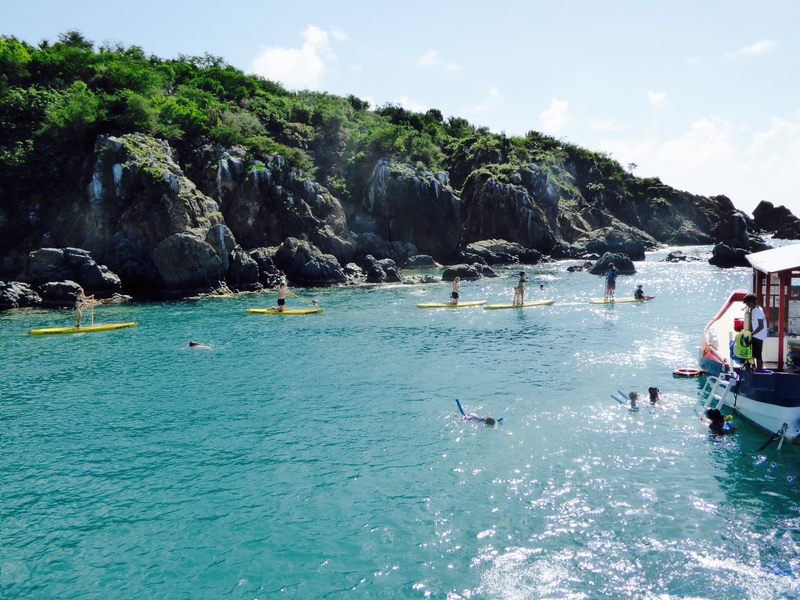 Today we swim, snorkel, and shop in Sint Maarten. 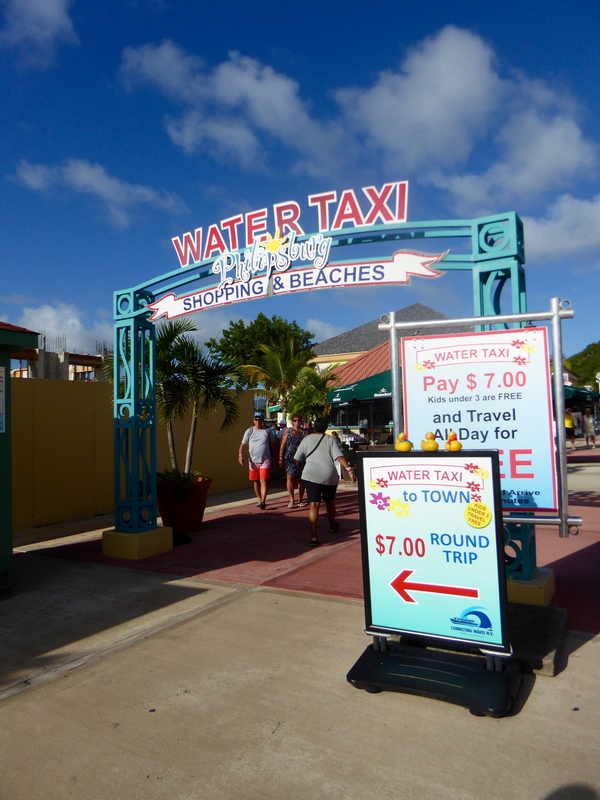 First we take a water taxi to Philipsburg, the capital of St. Maarten. After transferring to another boat, we all arrive at the floating Tiki Hut. Isn’t this beautiful? That pool has water from the Caribbean and we saw tropical fish there, eating bread. Bucket’s dad is already in the water. 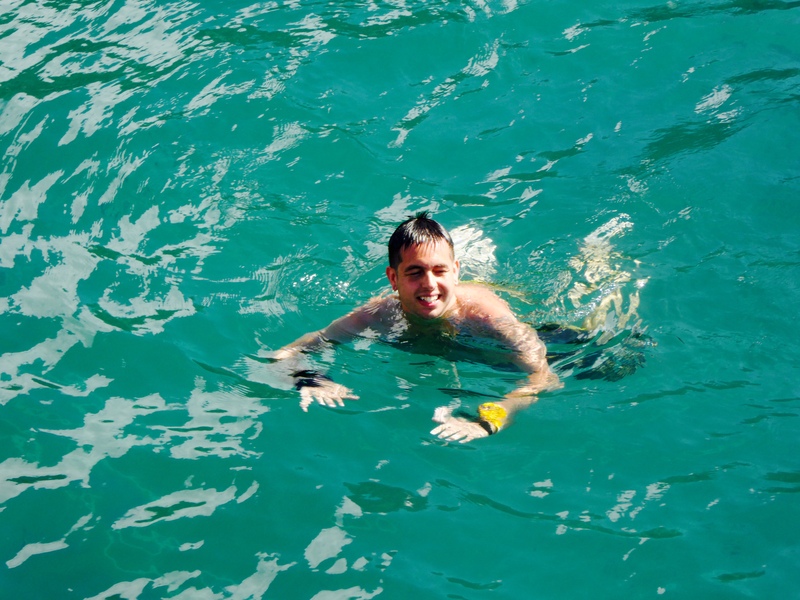 It looks fun, but again, no snorkeling mask in our size. Some humans are enjoying stand up paddle boarding. Oh this exciting. 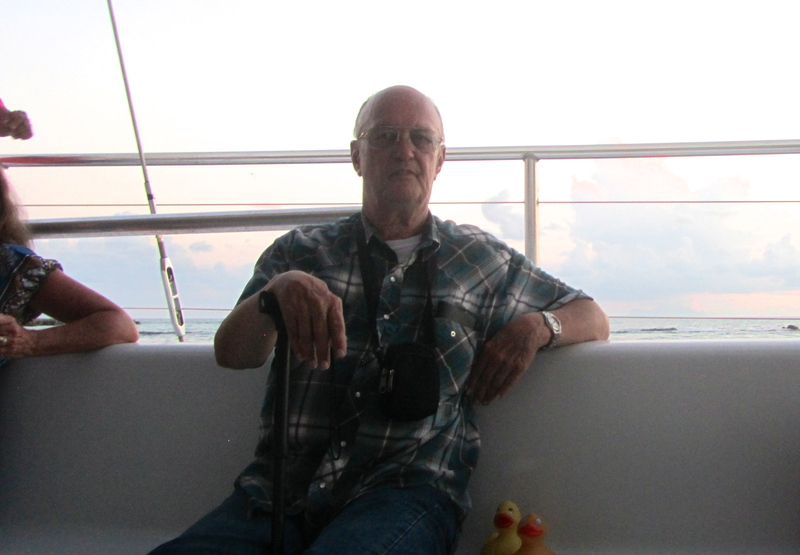 We, the Colorado Traveling Ducks, are swimming with Bucket’s parents. They are having a little problem keeping us together. This is so much fun. We are bouncing along on top of the waves. 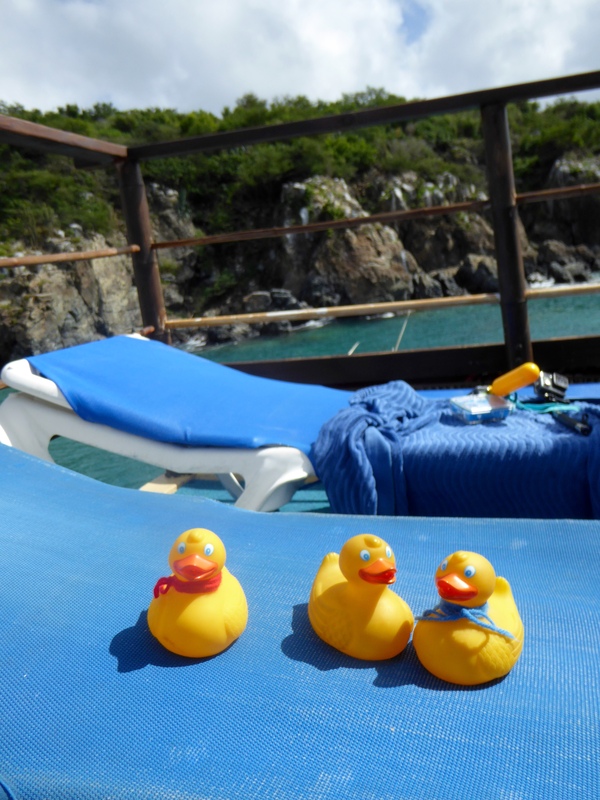 Back on the Tiki Hut, we ducks needed to rest and lounge in the sun. Swimming can be tiring, but it sure was fun! Look what we saw. 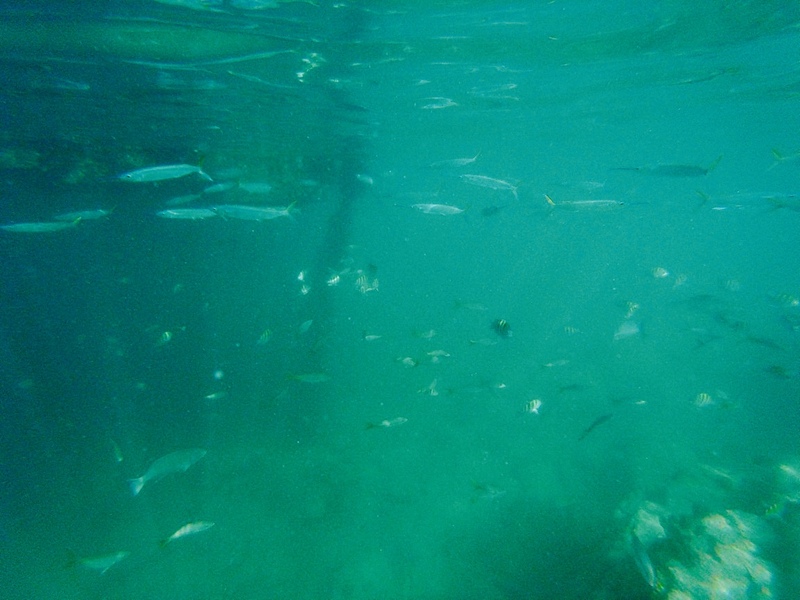 We could see the fish under water. We looked through Bucket’s parents snorkel mask! Bucket’s parents are on the floating platform, waiting for another snack. We already ate lunch here, but they are hungry again. 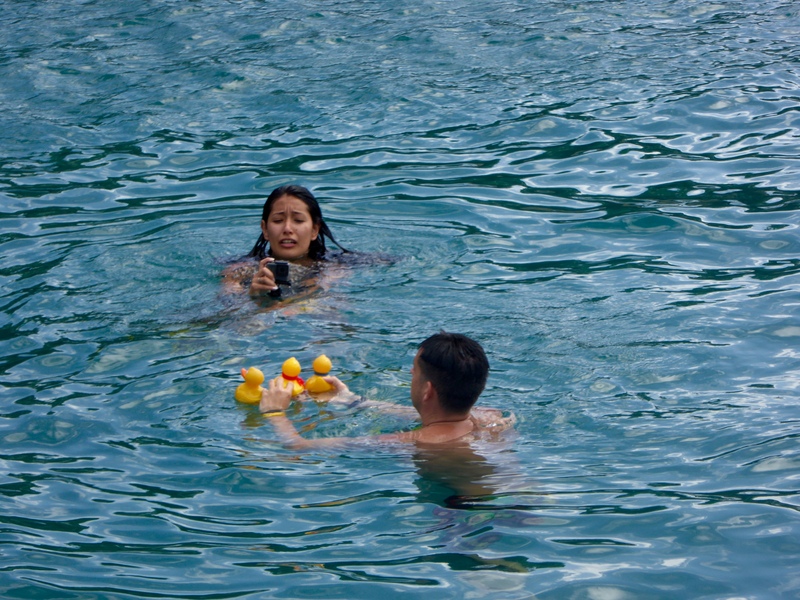 Taking ducks swimming causes hunger. It is time to leave the floating Tiki Hut, so we take the first boat back to Philipsburg. 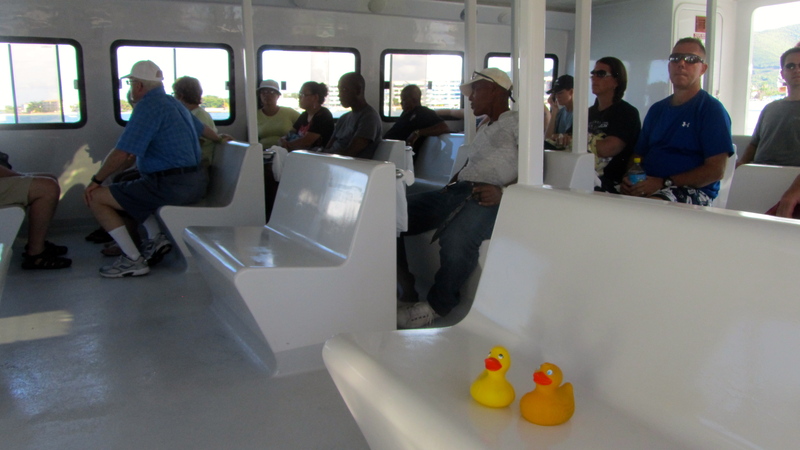 Then another water taxi to the ship. This is our cruise passenger shopping area. Beautiful tropical flowers also. These steps are very inviting. Let’s explore. 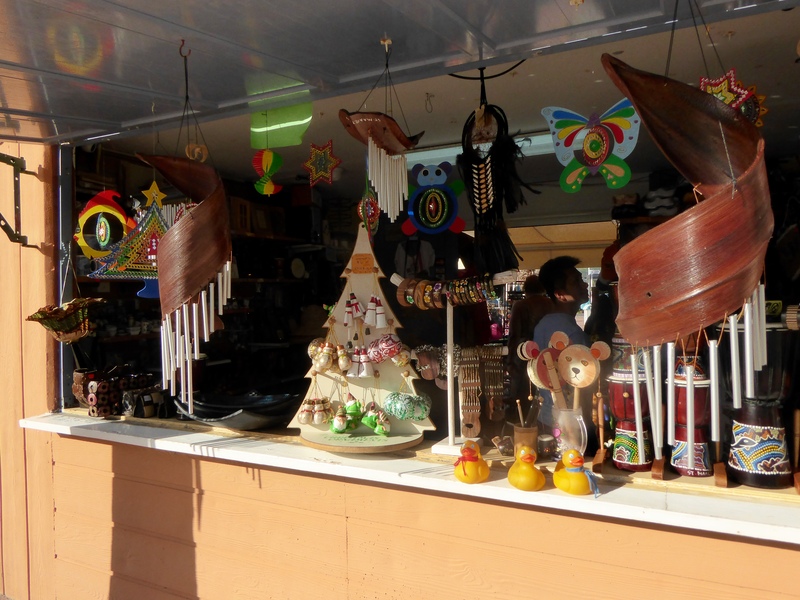 We like these crafts that are for sale. Following our moms on a shopping trip is exhausting. So, snacks and beverages anyone? Have a seat humans. There is just a little time before we board the ship, so hurry. Alaska cousin and Zeb the Duck head for the PeliDeli with our humans. We climb on the bus toward Phillipsburg, St. Maarten. This bus is provided by Ama Jewelers. 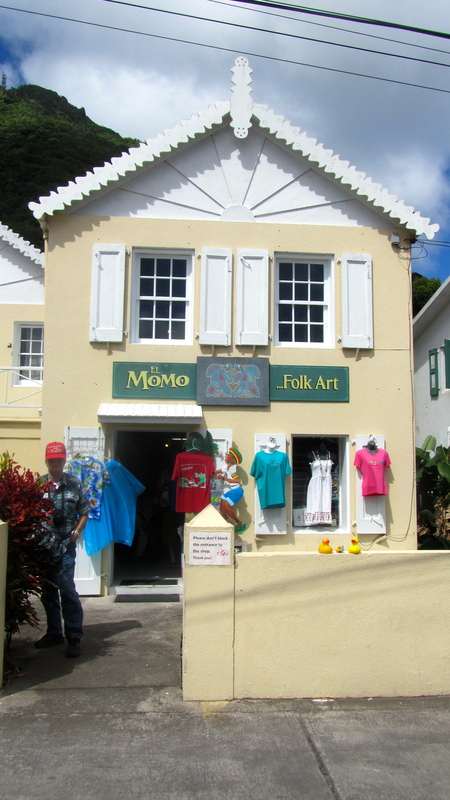 Ama has several stores in St. Maarten. The have really cute pendant necklaces with jeweled flip-flop sandals. That is so like the beach! Ama jewelers also specialize in colored diamonds. I think all human females love colored diamonds. We stop for breakfast at an outside café. With full stomachs, the humans wander through many shops. 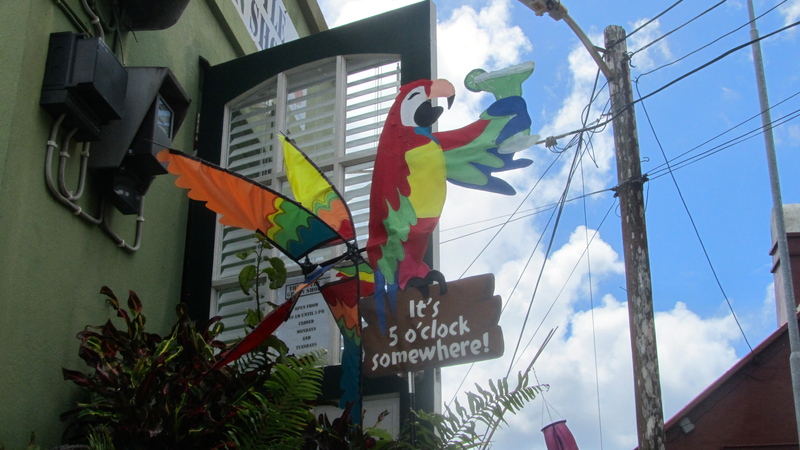 The streets are lined with stores, and this clock caught the duck eyes. 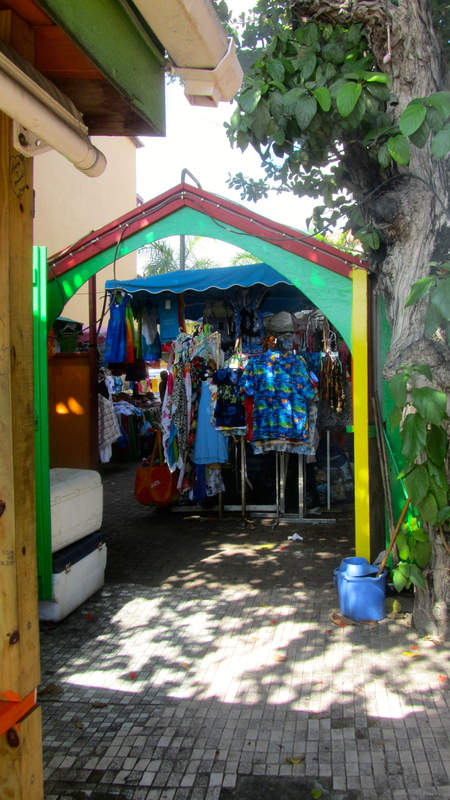 Phillipsburg, St. Maarten is one of the busiest shopping areas in the Caribbean. In additional to traditional stores, we enjoyed this market. 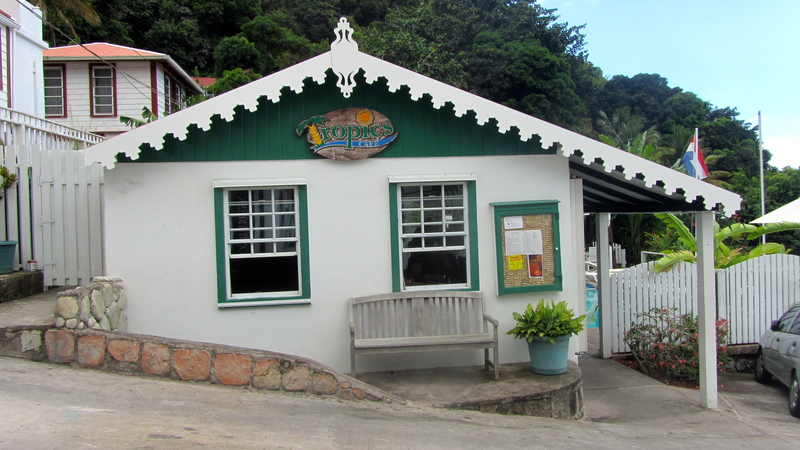 Many cruise ships stop here, for shopping, for beautiful beaches and of course, the many great spots for lunch. and other historical and government buildings. The street near the beach has so many human opportunities. Segways are for rent, as are many beach accessories. 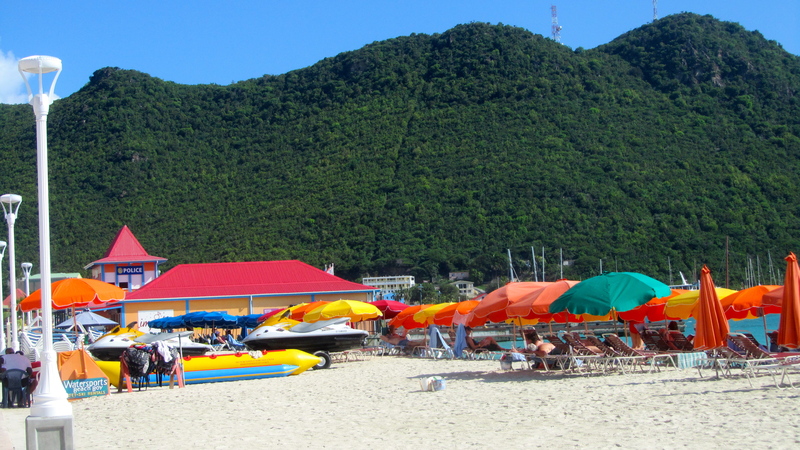 We saw shoppers, swimmers, boaters and people lounging on the beach and many humans in the cafes. This Pirate Sports Bar was interesting and had great figures to cause humans to notice the establishment. 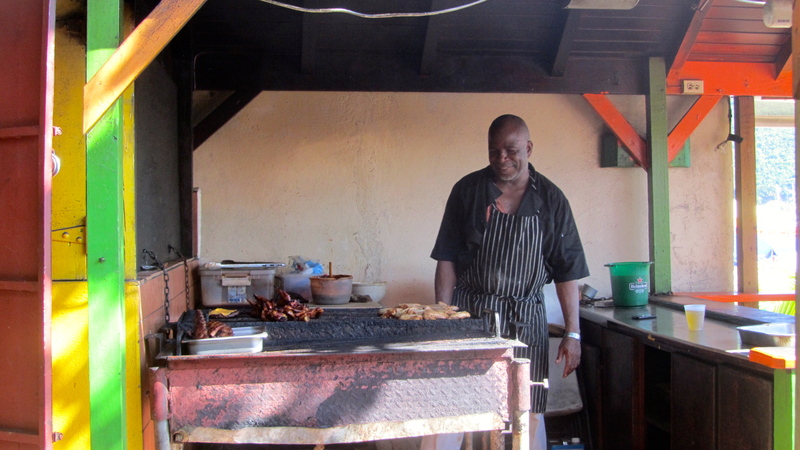 At this café, we could see the gentleman grilling this chicken. It smelled wonderful. We did have another snack here. Very tasty! 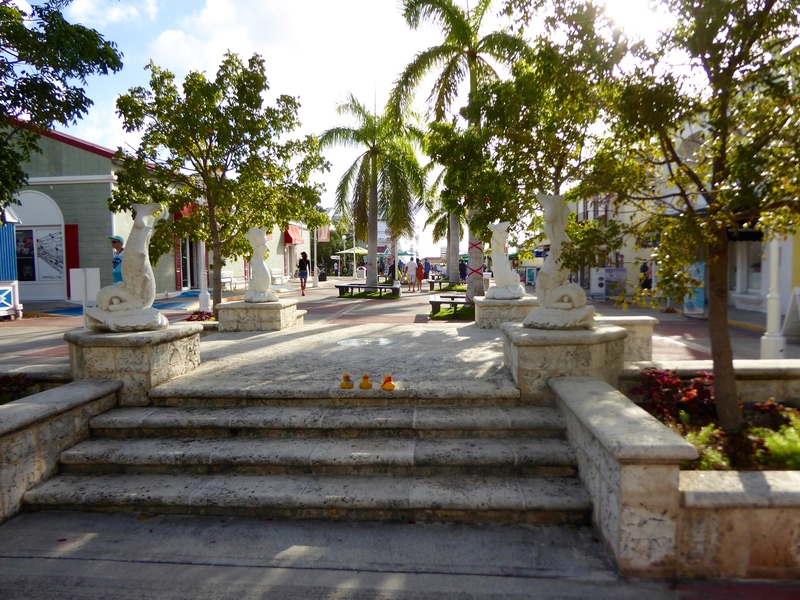 St. Maarten has guavaberries. This store specializes in guavaberry products. 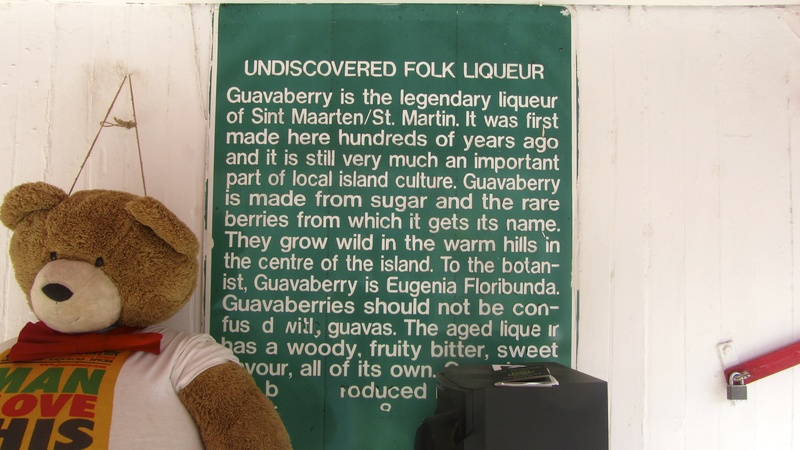 This sign promotes guavaberry liqeur. This is best enjoyed on St. Maarten as it is difficult to transport liquids on the airplane. 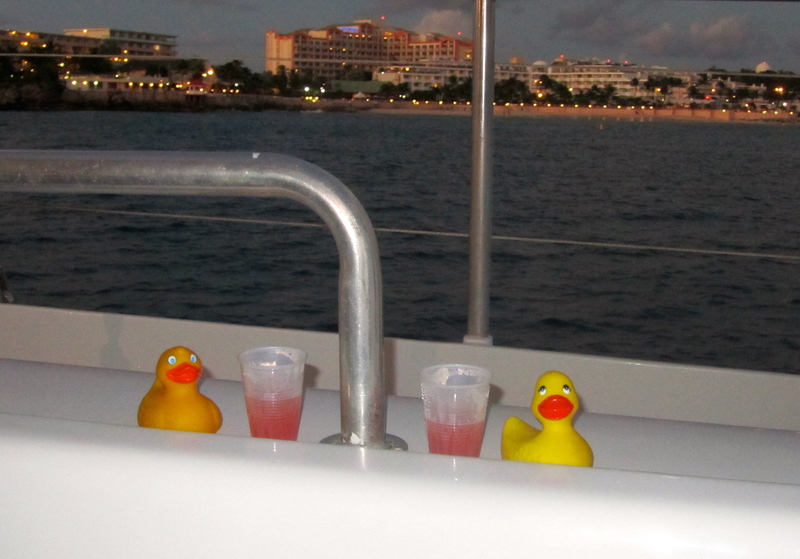 Tomorrow we leave St. Maarten and fly to St. Thomas so we did not purchase additional liquids today. 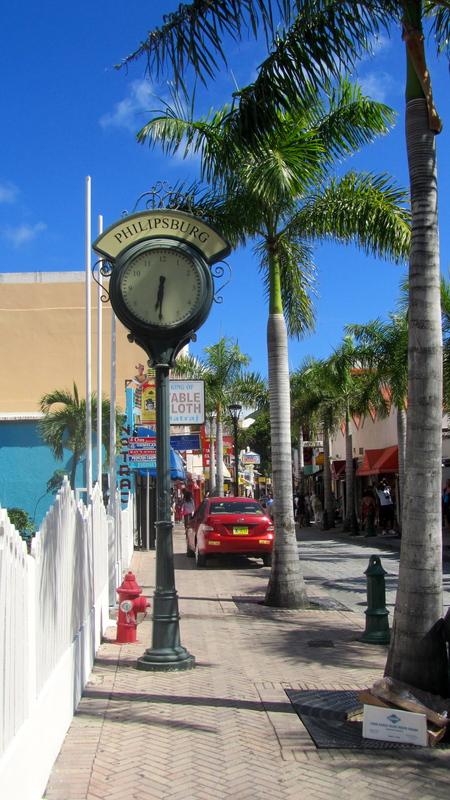 Phillipsburg is a busy port with great shopping. 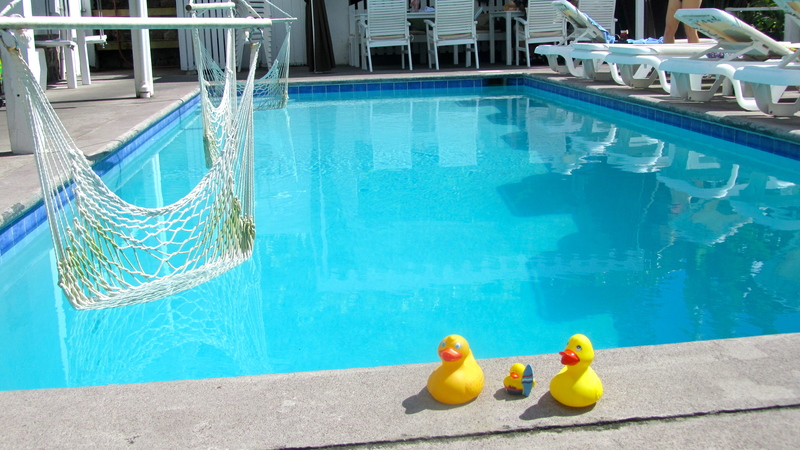 We ducks loved it, but were ready to get back to our beach and pool. The humans got a taxi and we headed back to our resort. We loved the shopping and activities of Phillipsburg and we think you would enjoy some time here also. Maybe some blue or canary diamonds?? 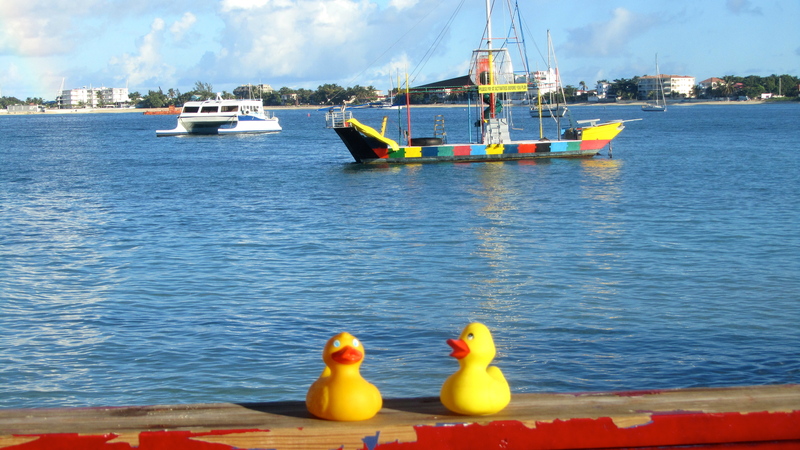 I, Zeb the Duck and my Alaska cousin are getting on a boat again! We love boats. 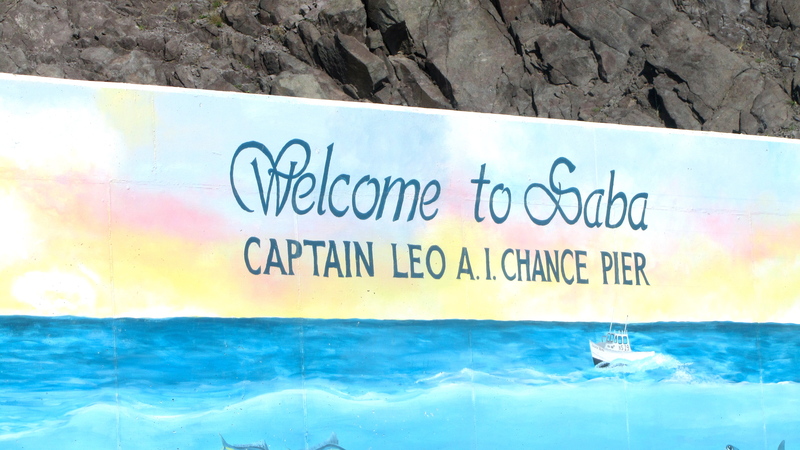 Today we are leaving St. Maarten to spend the day on the island of Saba. Saba is a Dutch island also, but we needed to show our passports. 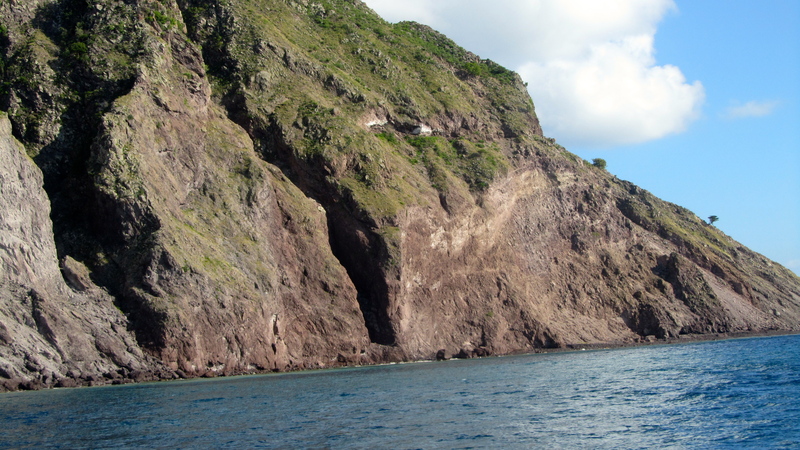 Loving the boat ride for 90 minutes and now we see Saba. It looks different. A giant rock rising from the ocean. No sandy beaches in sight. Maybe that is why we did not bring swimming suits and towels. This sign makes ducks and humans feel welcome. First stop is immigration and passport control. Now, ready for a new adventure. The road is a miracle. It was built by hand; no heavy machinery available. Local men started building the road in 1938 an it was finished in 1958. 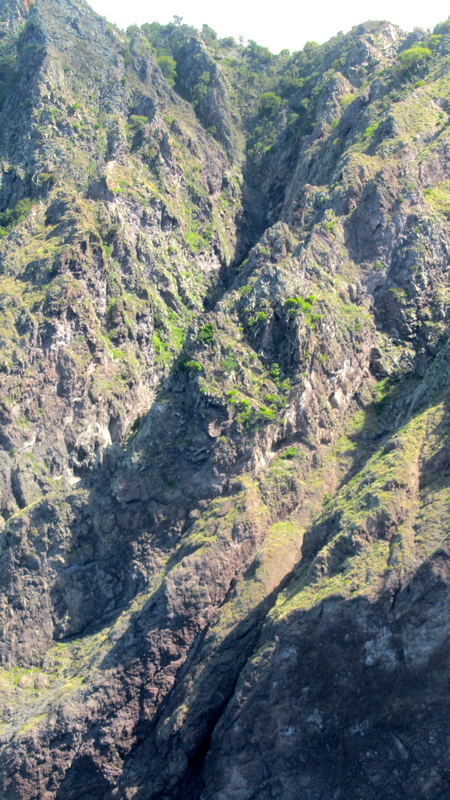 Previously crossing the island involved a 7.5-mile staircase. Everywhere is steep up or steep down. 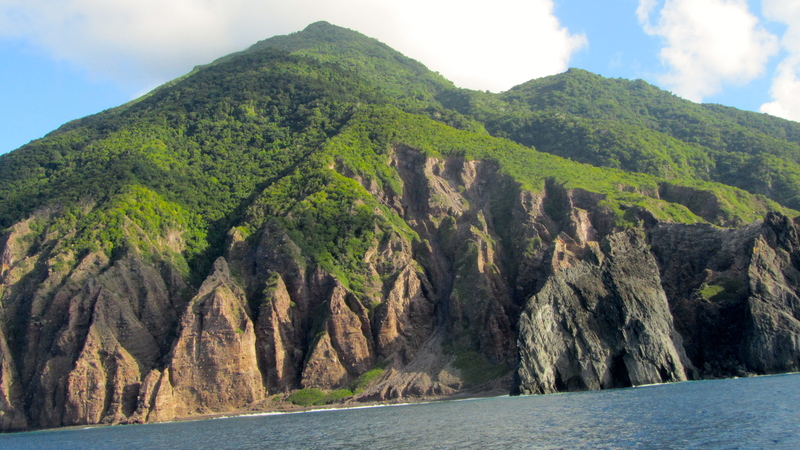 Saba is a rocky island! Our first stop after leaving Fort Bay is The Bottom. The Bottom is the capital and largest city. 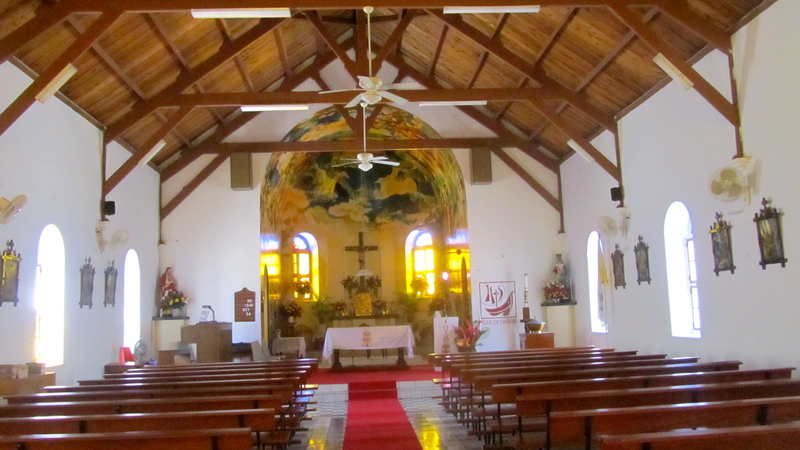 This Sacred Heart Church, 1935, is beautiful inside and outside. 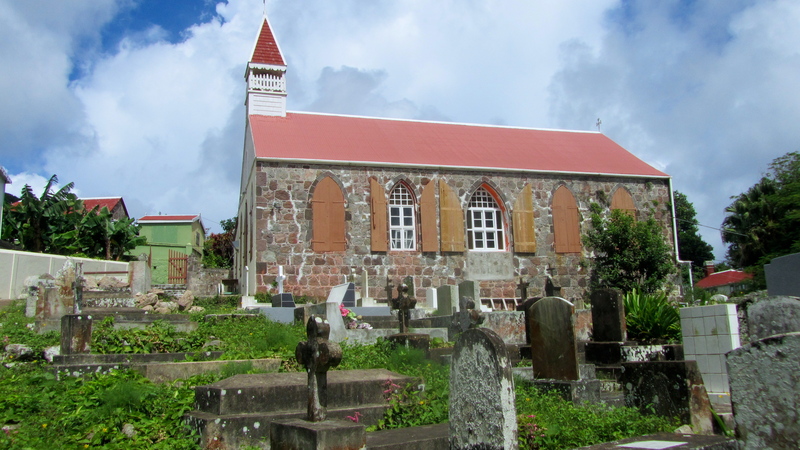 In Windwardside we shopped a little, visited Holy Trinity Church (Anglican Episcopal 1878) and cemetery. While shopping we found a relative. 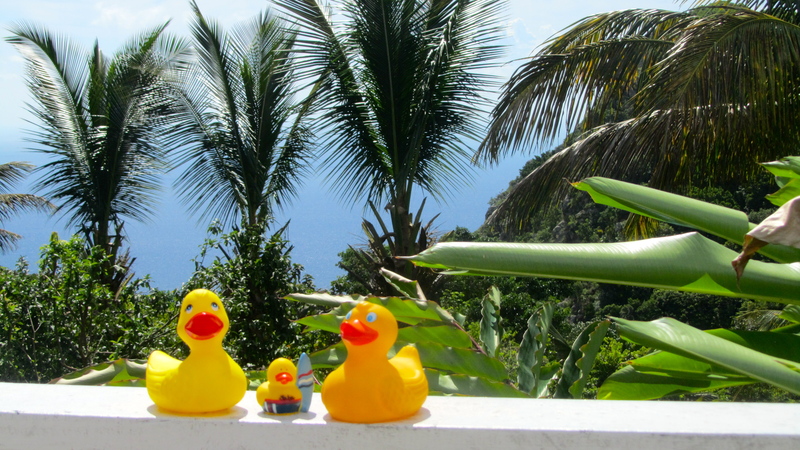 Little Saba Surfer Duck is now part of our family. 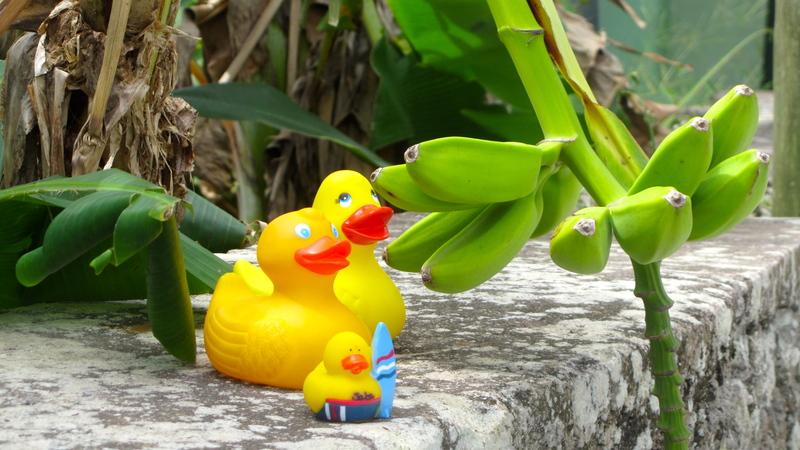 Here we are posing by bananas. These streets are narrow and very steep. Our humans had a real workout just walking through town. Lunch at the Tropics Café was great. but we were busy looking at everything else. This is a great location. Looking from the road, the roofs are far below us. 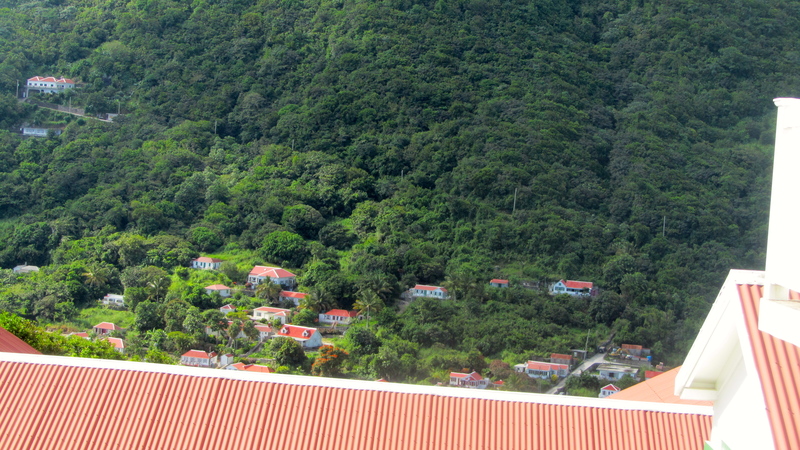 From certain views, we saw other Caribbean Islands. 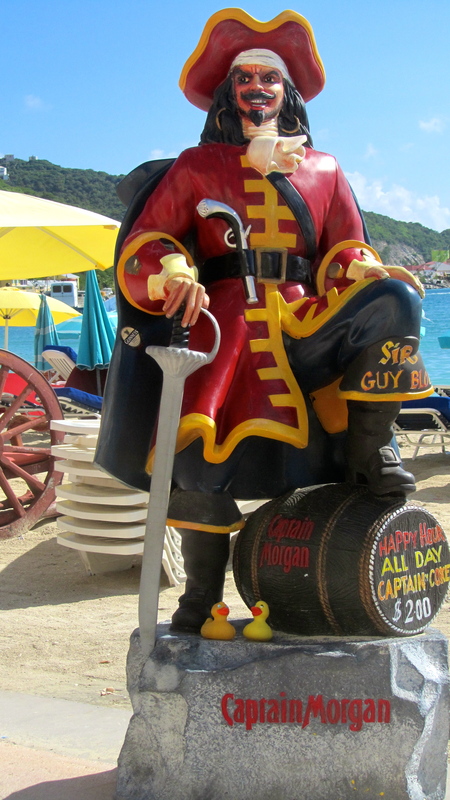 Now the time has come to return to Fort Bay and ride the Edge II back to Sint Maarten. 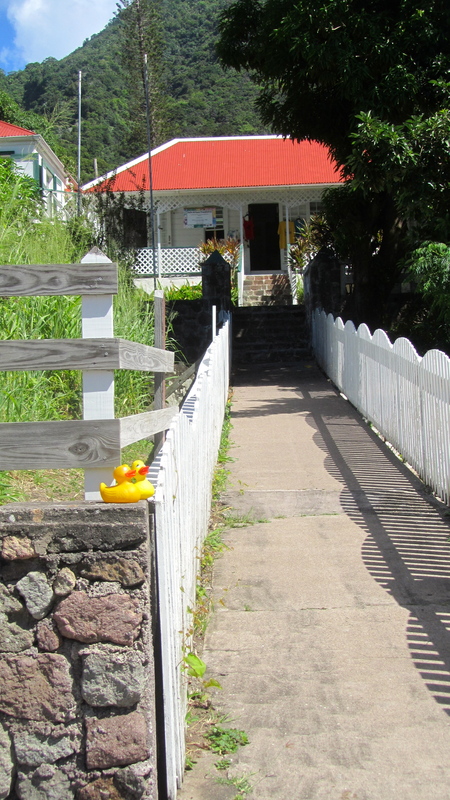 We ducks and our humans had a great time on Saba. 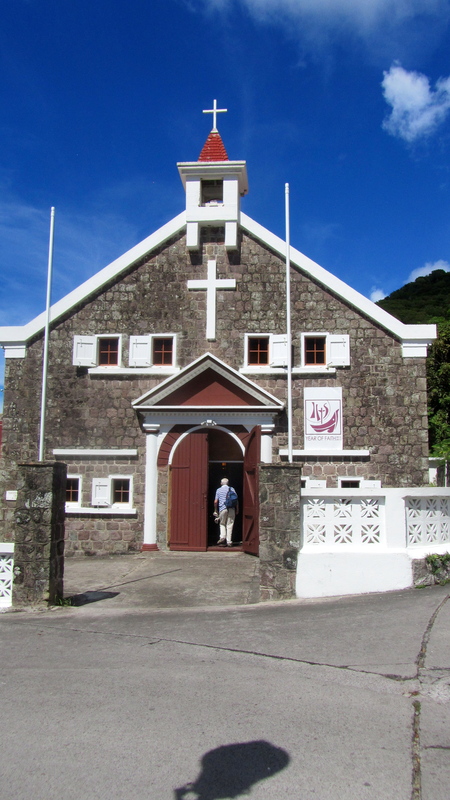 We think you would enjoy Saba also. If you go, tell us what you liked best. 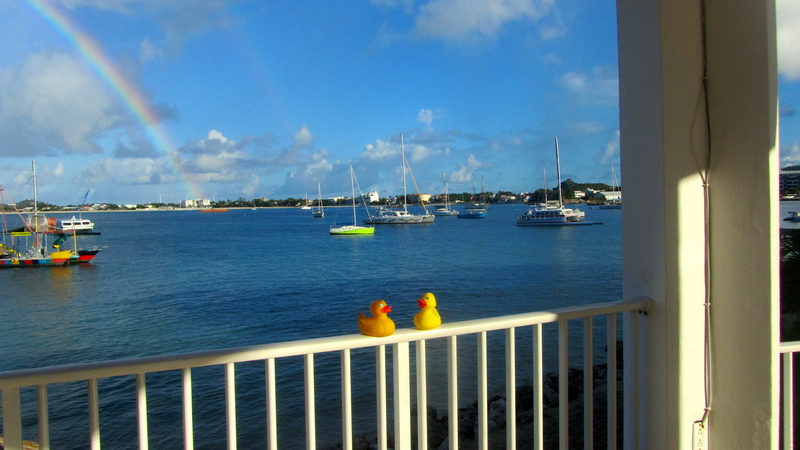 My Alaska cousin and I, Zeb the Duck, viewed this monument near Phillipsburg, St. Maarten. 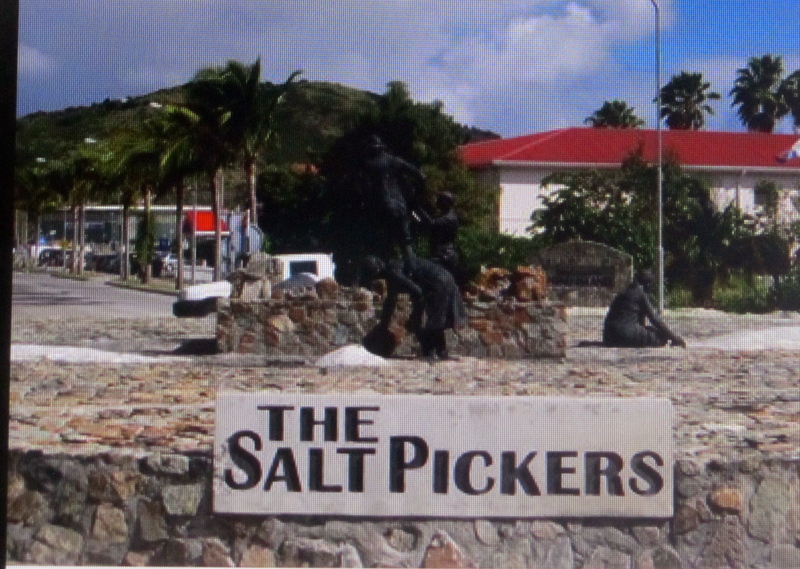 We did not know what a salt picker was. Now we do and we want to refresh your memory of history also. 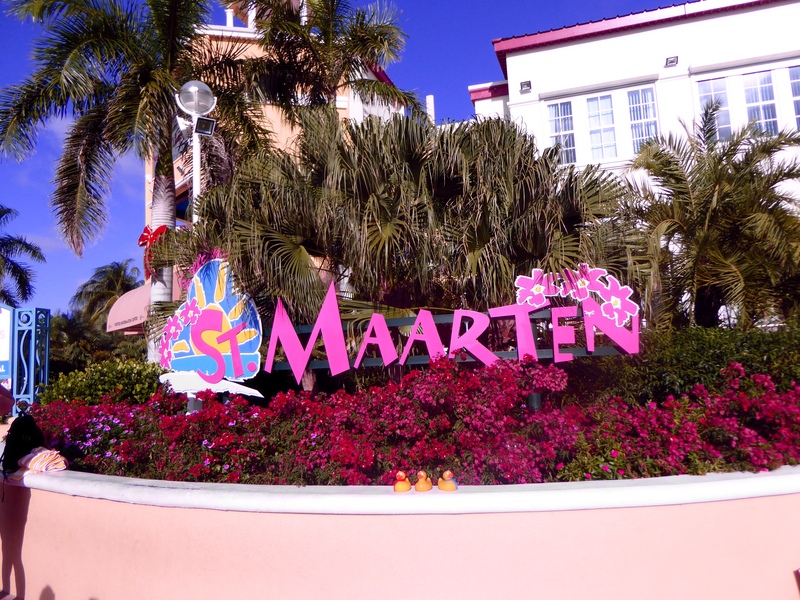 From 1624, when the Dutch found the Great Salt Pond until the 1960s, salt production defined the history and economy of St. Maartin. 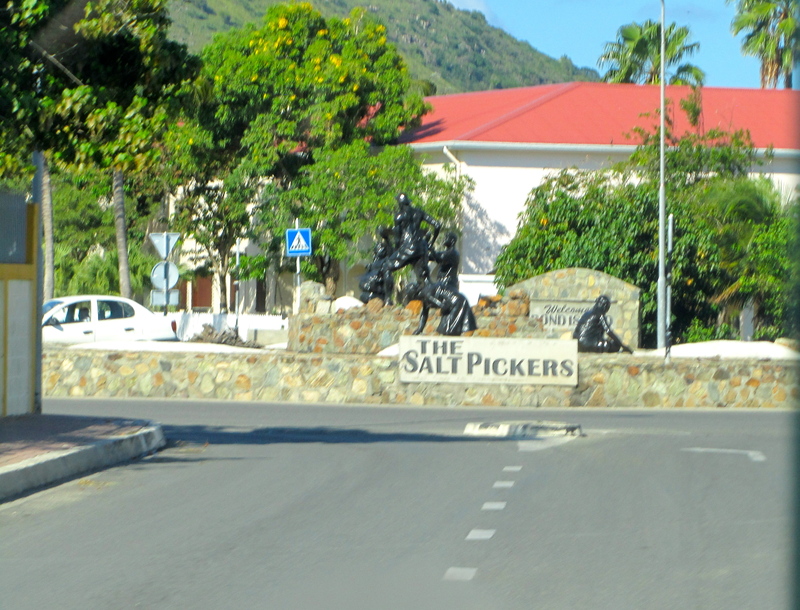 Free people and slaves from the Dutch and the French side of the island completed the hard work of harvesting salt. Salt has always been important to the island. The Arawaks called the island Soualugia. Soualugia means land of salt. The Dutch side of the island farmed and exported as much as 400 boatloads of salt per year. Wow! That is more than one boatload every day. Salt is collected as the sun causes the seawater to evaporate, leaving salt crystals. One method involved shoveling and scraping the salt crystals from the ground. Another process involved putting stakes in the salt ponds. As the water evaporated, salt crystals remained on the stakes. The clumps of salt crystals were removed by hand (called reaping) and used or exported. 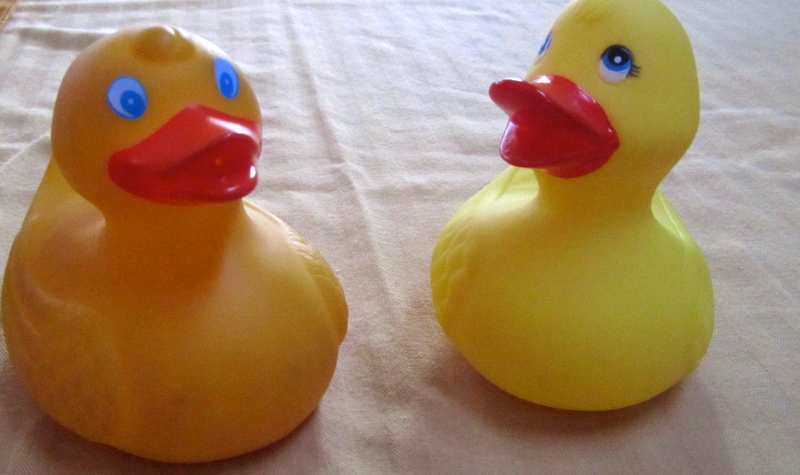 Zeb the Duck with Alaska cousin. are in awe of all they accomplished through hard work and sincerely appreciate their efforts. A dinner cruise on the Tango sailboat! 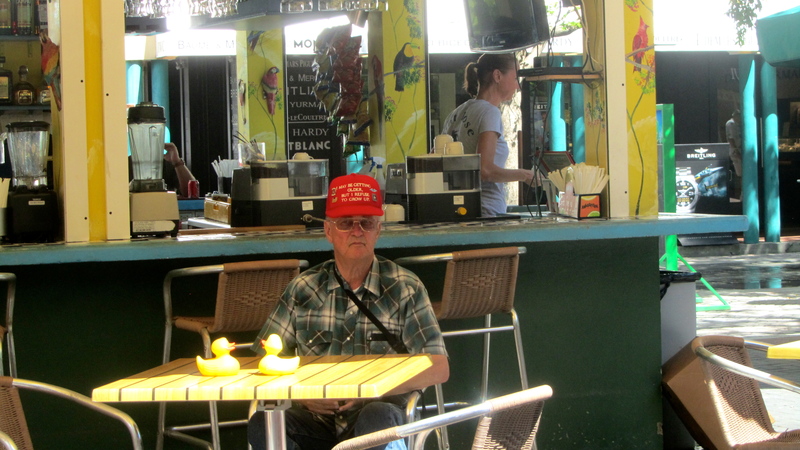 St. Maarten has everything. On the boat by 5:30 and we were ready for fun. Here we are with Alaska uncle. Ready for our first sailboat cruise. We are really cruising. Far behind us the shore waits for our return. As the sun gets lower in the sky and darkness approaches, we try some rum punch. and he thinks we are cute. So is he. With darkness our buffet is created. We enjoy fish, chicken and a beef dish. 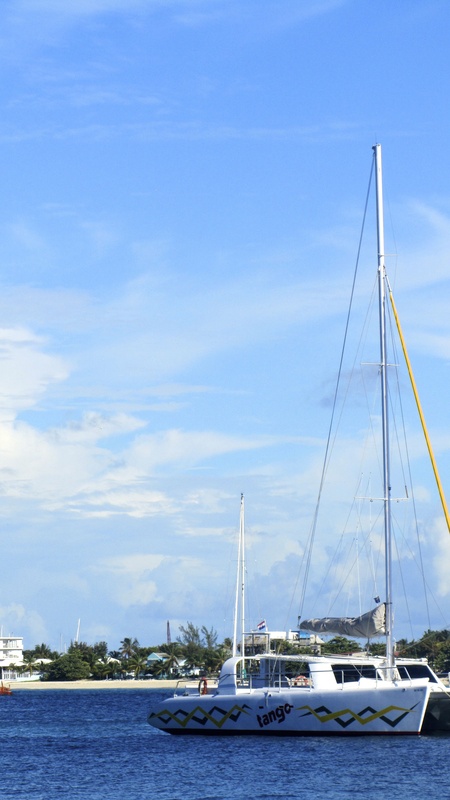 Sometimes walking on a sailing boat is a bit of a challenge, but we love it. There is so much to say about this cruise, daylight, sunset, drinks, food and wonderful new friends to get our food ensure that we have a perfect Caribbean evening aboard the Tango. It is dark and time to go. 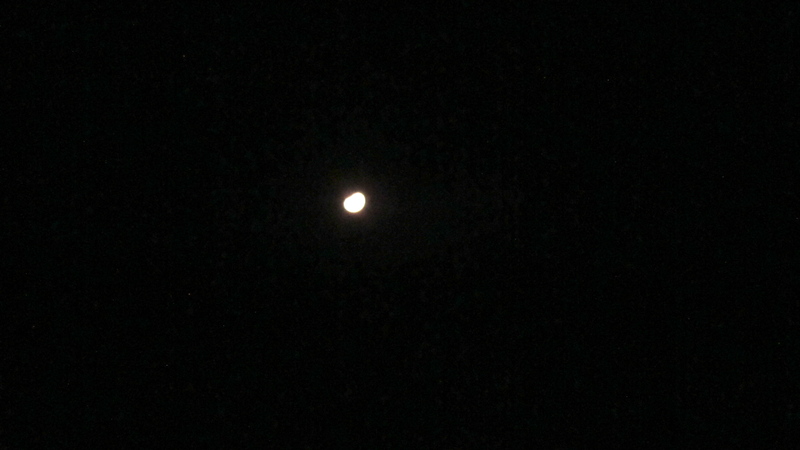 The moon is watching over us as we return to our resort. We loved this trip and believe you will too. Don’t wait too long, it is too much fun. 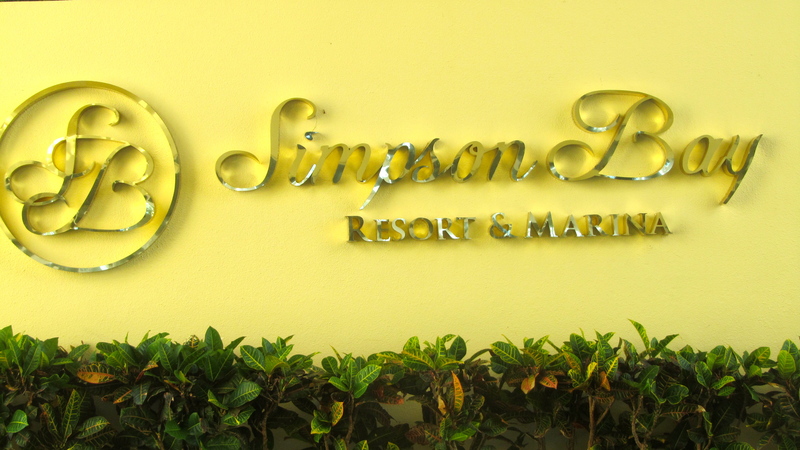 Last time we talked to you, we shared our discoveries at Simpson Bay Resort and Marina. Mom and Alaska uncle had been here about 7 years ago, but the complex was called Pelican Resort. 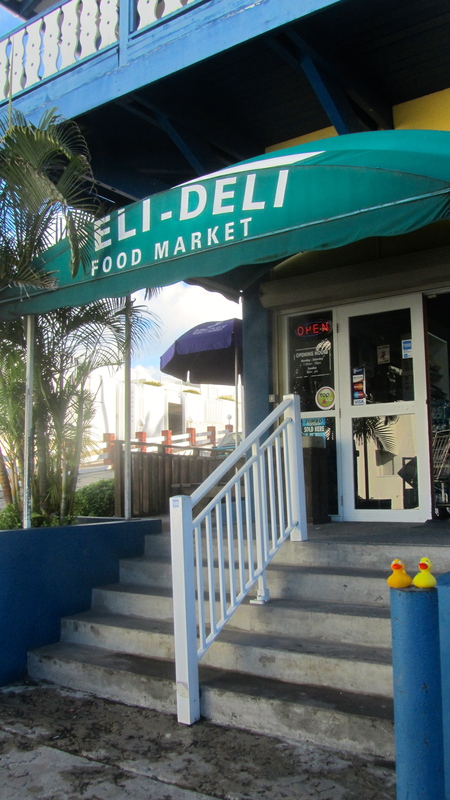 Pelican resort had a wonderful convenience store that was called the Peli Deli. The Peli Deli is still there. 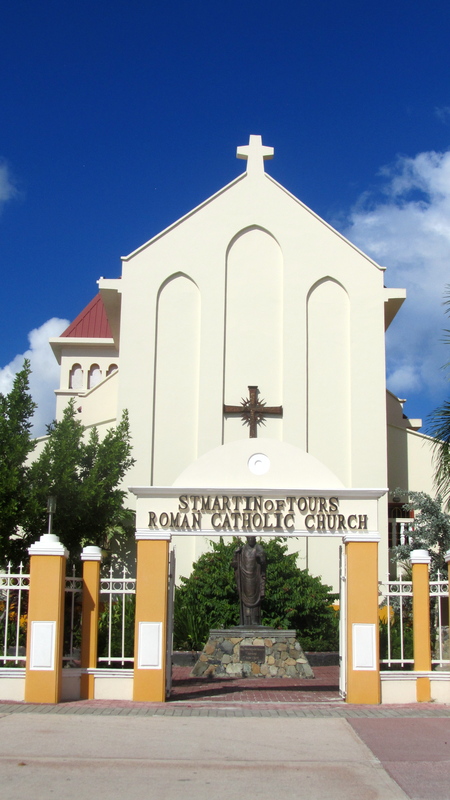 They have everything and for reasonable prices, not inflated resort prices. We bought pop, beer and lots of ice cream bars there. Even other snack food. We love the Peli Deli!! Our resort uses solar power to heat the water. 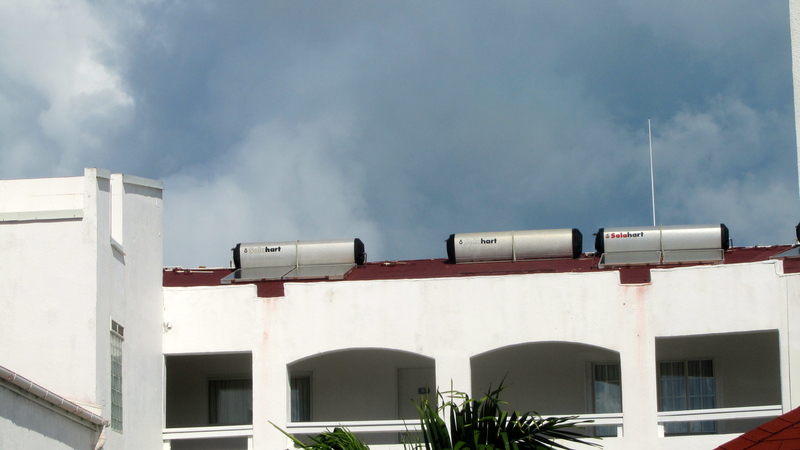 Here is a picture showing the solar panels. We like energy savings places. From our room, we see the pool, the pool bar and the beach. One day at the pool we sat under this branch. 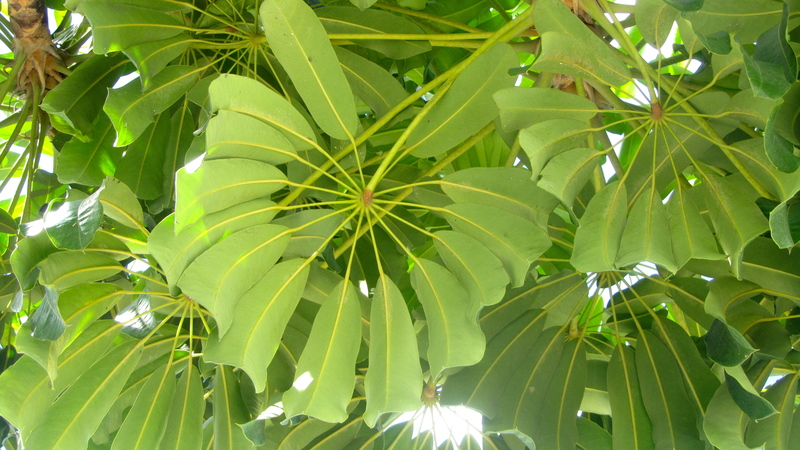 These leaves looked interesting from our lounges. We had a bit of rain another day; here is the rainbow. This boat, or raft, for kids to play near the beach is great. 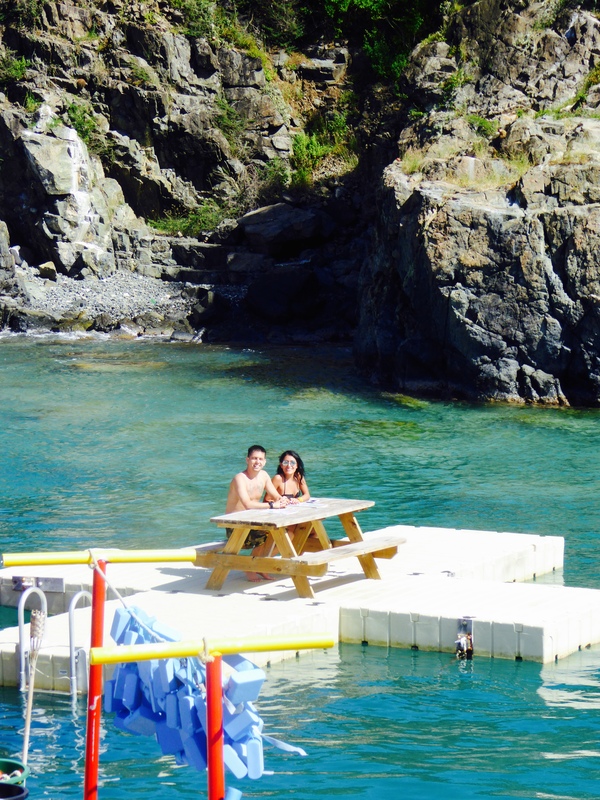 The slide, the diving platforms and its location in the water make us yearn to be young humans. The marina area has restaurants, stores and many boats. 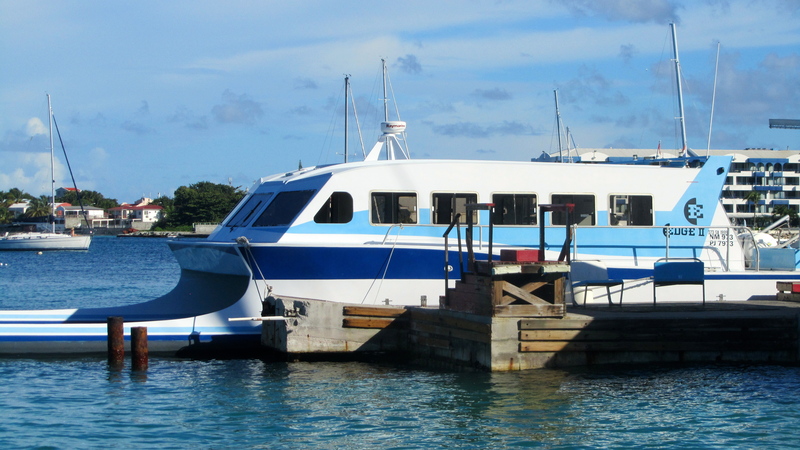 The store for water sports or boat trips is called AquaMania. 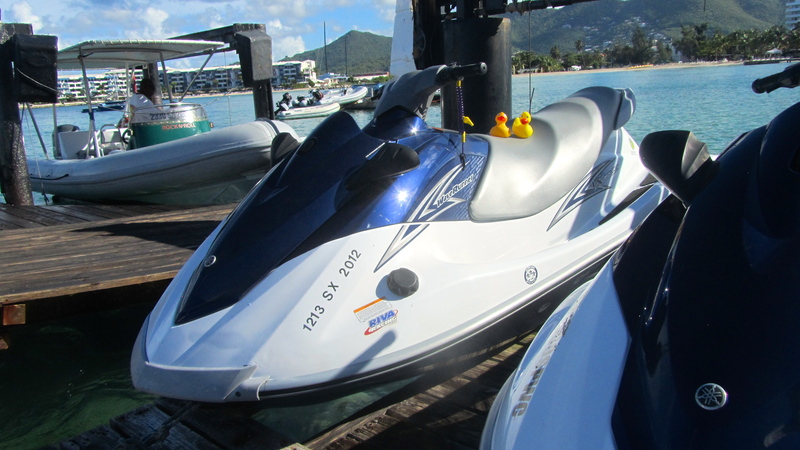 These jet skis are a lot of fun. AquaMania is where we purchased tickets for Saba. Another evening we sailed on a different boat for the dinner cruise. My Alaska cousin and I will tell you about those trips another day. 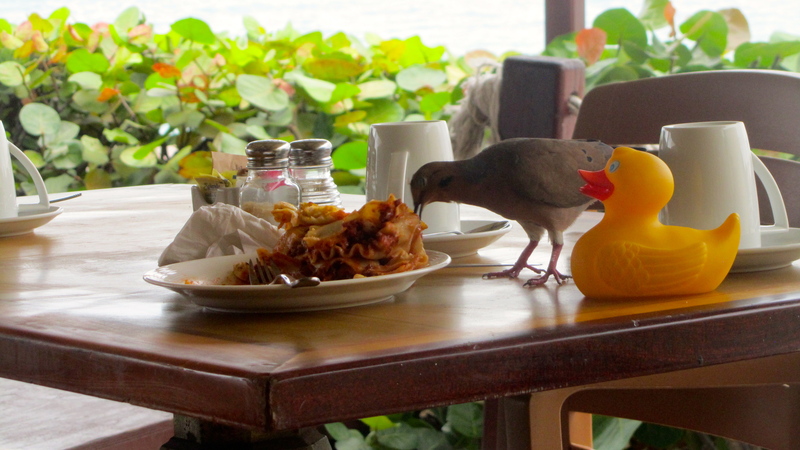 One morning during breakfast at Alexander’s by the marina, these birds enjoyed someone’s extra breakfast. The pool by the main lobby is a little larger than our pool. It is very pretty, but we love our pool. 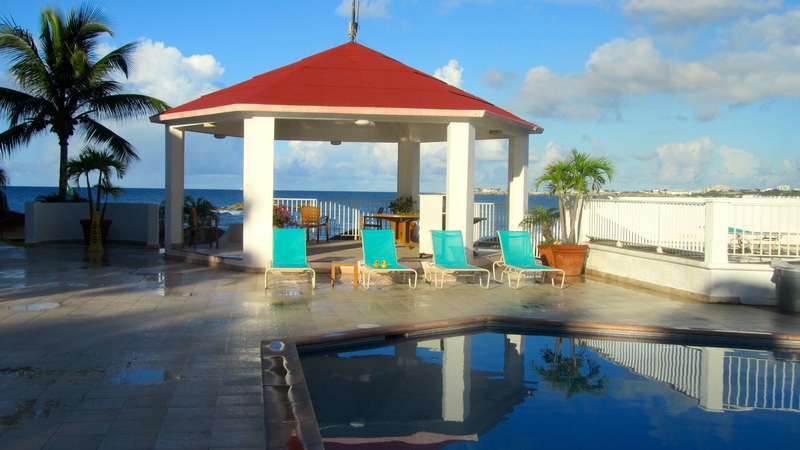 Simpson Bay Resort and Marina has time-share condos, so there is a sales staff at the resort. The sales manager and staff organized a couple events for all guests. The events were nice, but there were a few concerns. We talked to a staff member and also wrote a letter about our concerns. We did not even receive an acknowledgement about our letter or concerns. 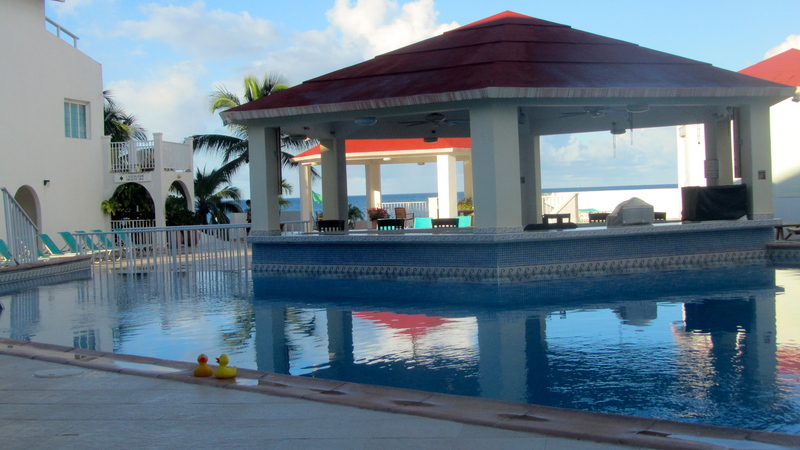 While we liked the resort and would happily stay there again, we would not purchase a condo as long as Jozef O’Niel, Director of Marketing or Rick work there. If we were not important as guests and prospective buyers, we would never feel important or valued as owners. Alaska uncle owns several weeks in Las Vegas, Nevada and mom owns multiple weeks in Winter Park, Colorado. That will be enough for now. We are in the Caribbean!! I see the beach. It is warm and sunny here. 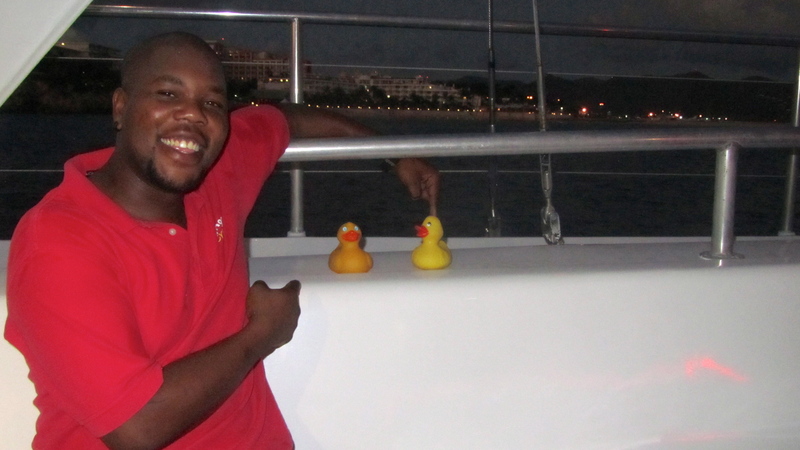 My Alaska cousin and I, Zeb the Duck, love Sint Maarten. Cool Dutch spelling! Mom and my Alaska uncle say we will stay here for a week. Our condo has views of the ocean and one of our pools. We have several dining choices here. For breakfast we can go by the marina and eat at Alexander’s. We can go just past the Peli Deli (more on that wonderful place later) and eat at Bon Appetit. Dinner is served at Alexander’s other restaurant, upstairs by Bon Appetit. We can choose The Stone by the marina or the Hollywood restaurant by the Hollywood Casino. 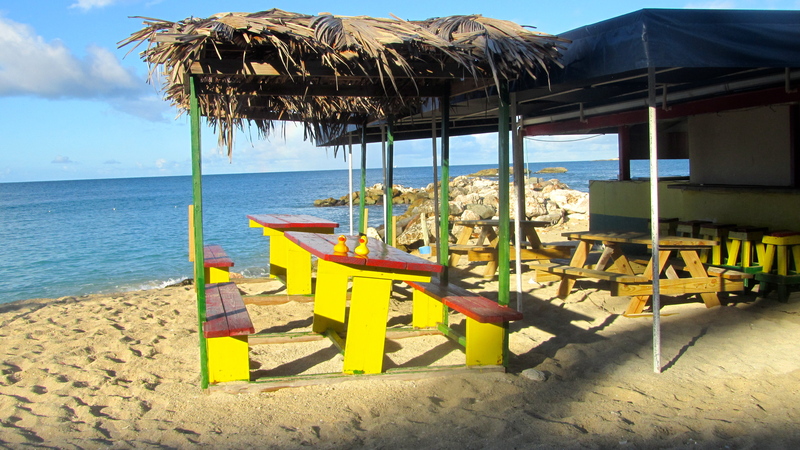 Also, the pool and beach bars serve lunch and early dinner. So many food choices! We tried almost all of them. We have two pools. One is just outside our door. They offer water aerobics classes in our pool every morning. 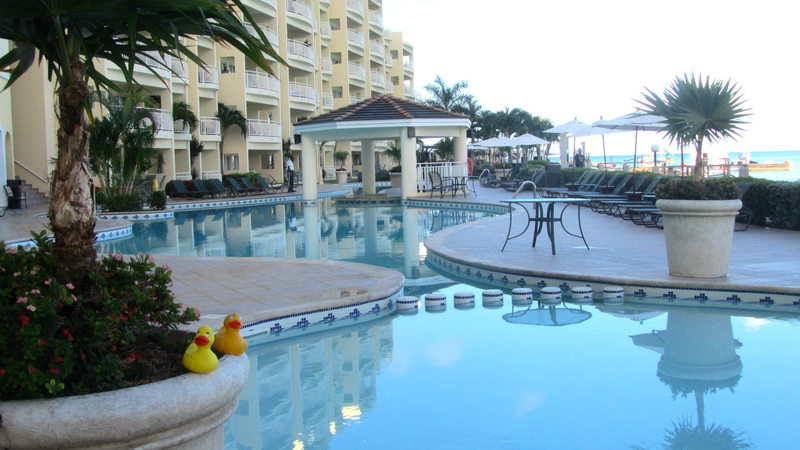 The other pool is by the next building near the complex lobby. 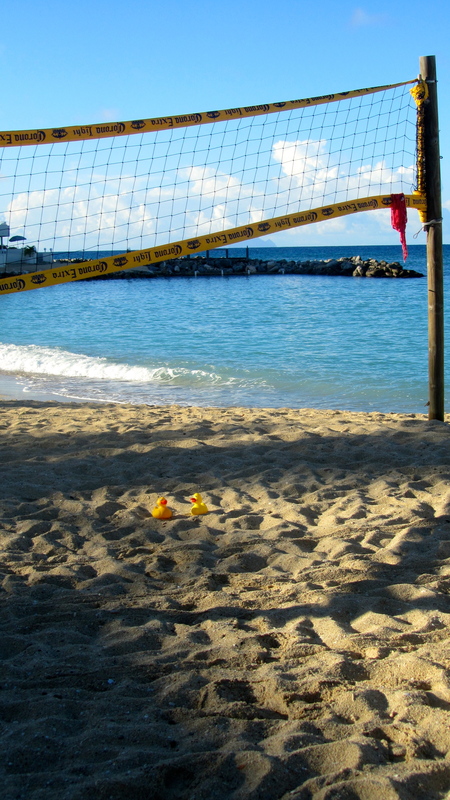 Since we ducks have never even seen a beach, let’s start there. Our beach is on a bay, so we have gentle waves that humans love. Some humans swim, some play in the waves and some walk around the ocean water with big smiles on their faces. There is a bar, which serves mixed drinks, beer, soft drinks and many sandwiches. Everything I tried there was very good, and I tried lots of things! We walked on the beach and even got wet when the waves came further up the sand. It is fun. The water is warm, but rather salty. There is a net for beach volleyball. We could never hit a ball that high, but we could have fun playing here. A man brought beach lounge chairs for us to use. Very nice. He put the chairs by shade and a little table. Mom said these grassy shade things are palapas. We love the beach. A lady is selling some beach supplies. 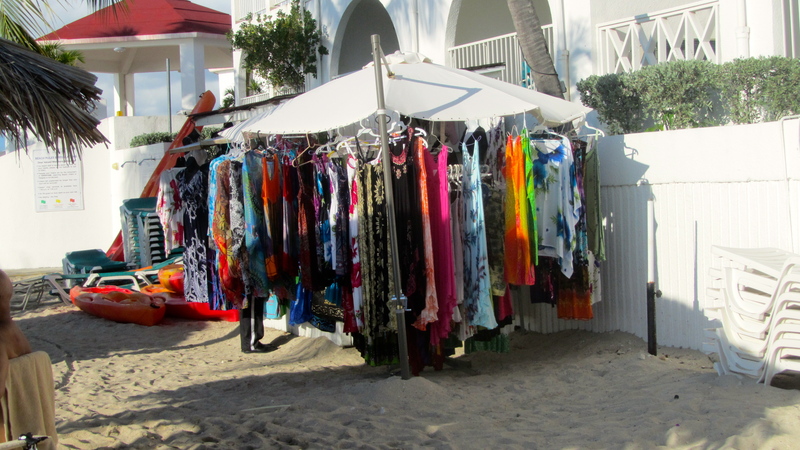 She has hats, dresses, swimsuit cover-ups, beach bags, some jewelry and other items. This is so convenient!! 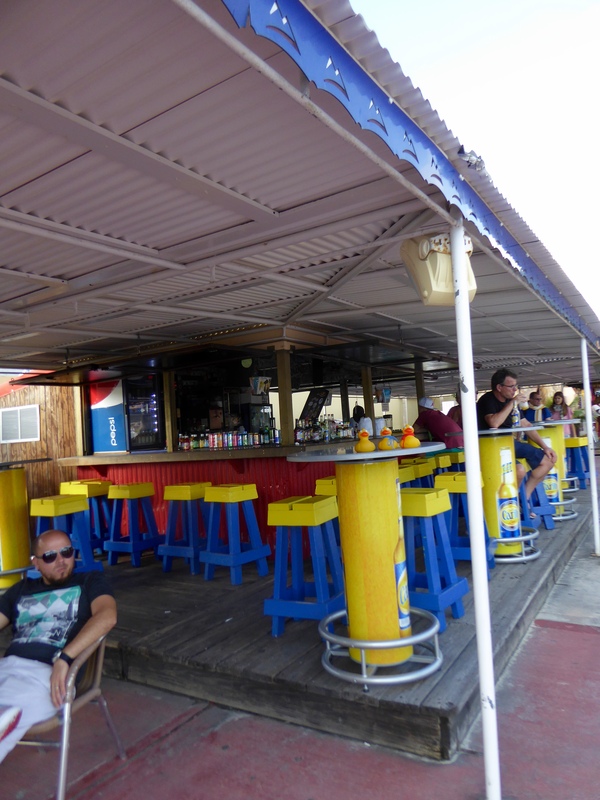 Of course the beach bar provides food and beverages for us. 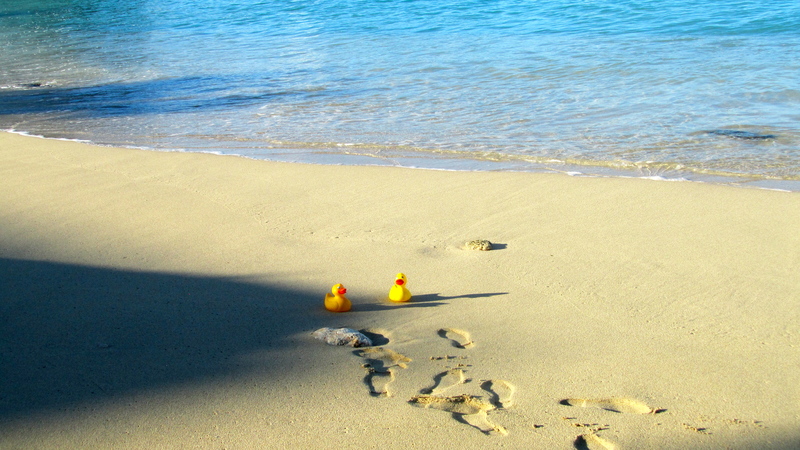 We ducks want to play on the beach, so we will continue this next time. Sunshine, sand and warm water. This is perfect.